If you’re a regular user of social media platforms like Facebook, you’ll likely have noticed the trend that took over towards the end of 2015 and the start of 2016. It seemed that everywhere you looked, you came across Bill- a smart stick-figure character who practically took over the internet. This simple illustration imparted everyday common sense wisdom and inspired thousands of copycat memes (captioned photos that spread virally across the internet and are often humorous in nature). His popularity was such that there is now a book out that celebrates some of his best-loved words of wisdom. 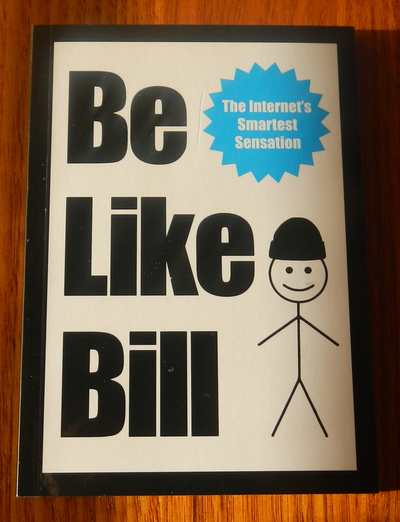 An internet phenomenon, Bill (and sometimes his female equivalent, Bella), exercise passive-aggressive natures that encourage good manners, respect and consideration. They believe that friendships and relationships should take precedence over smartphones, that not everything needs to be shared on social media and basically call out on all of the social media behaviours that annoy them (including selfies, hashtagging everything and sending multiple game requests to friends). People who are unfamiliar with Facebook (and most of the references that I have made in this review) are unlikely to understand the book, or find it appealing. Although there are some pages that make no reference to the internet and instead impart wisdom about real life, they are few and far between. That said, most people who have accounts on Facebook and have seen Bill pop up on their newsfeeds will probably have already seen the ones that feature in this book. So unless you’re after a hardcopy memento that features one of the most popular internet memes to date, you could be forgiven for giving this book a miss.